From 4UT just after the moonset, I was observing one hour looking around the Leo area. I begin to sketch the sky region where I was looking, +/- 45° from the radiant. We can see the Leo and the red Mars underneath. Each time a meteor was burning out I put the trace on my white paper link with the estimated magnitude. Let says one minute after, because already years ago, I realized that sometime a meteor is following shortly by another one, just on the same track, like a double meteor. This morning I saw 42 Geminids and 2 sporadic’s, I don’t sketch the sporadic meteor here. The speed was quite low and the magnitudes quite brilliant. The small village where I’m don’t care about light pollution, ok then, I use this to sketch the Christmas street decoration like it is. Latitude 43 degrees 18′ 15″ North. Based on this, my ZHR observation reaches 250! It was a nice watch, a wonderful spectacle indeed. Très beau et bien mérité ce passage sur ASOD. 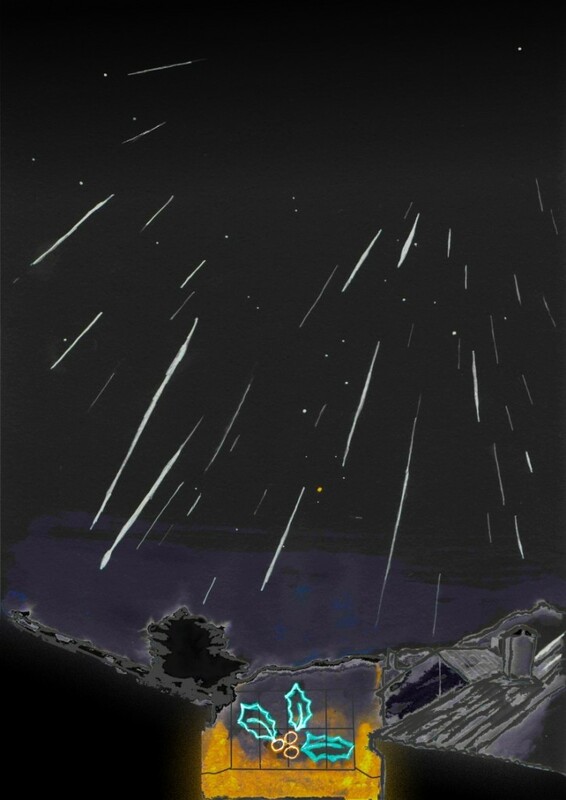 This is an example of how to do a meteor shower sketch. Spectacular. Great, my dear friend! … As usually! très beau rendu pour ces géminides. Le houx électrique ajoute une touche surréaliste au tableau qui l’est déjà naturellement. Je découvre tes aquarelles et ton site avec beaucoup de plaisir. Bon ciel et bon vent. Thank you to you all for your nice comments! You know, I really appreciate!